To reach Conglog quarry involves walking up picturesque Cwmorthin along the old Conglog Tramway route. This starts proper at the head of the short Lake Incline, built by Conglog to connect their tramway with the Cwmorthin quarry system, and then follows a level route beside the south western shore of Llyn Cwmorthin. When the lake ends the tramway route continues, now with the head of the valley in sight and the mountains towering all around. The first photo shows this scene, in 1990, with scorched grass everywhere from a hot summer. The giant Rhosydd tips are now also coming into view as is Conglog in the far middle distance. Over to the right, amongst the trees, are the remains of Plas Cwmorthin. Built in 1860 this was the Rhosydd quarry managers house and has been abandoned since the early 1930s. 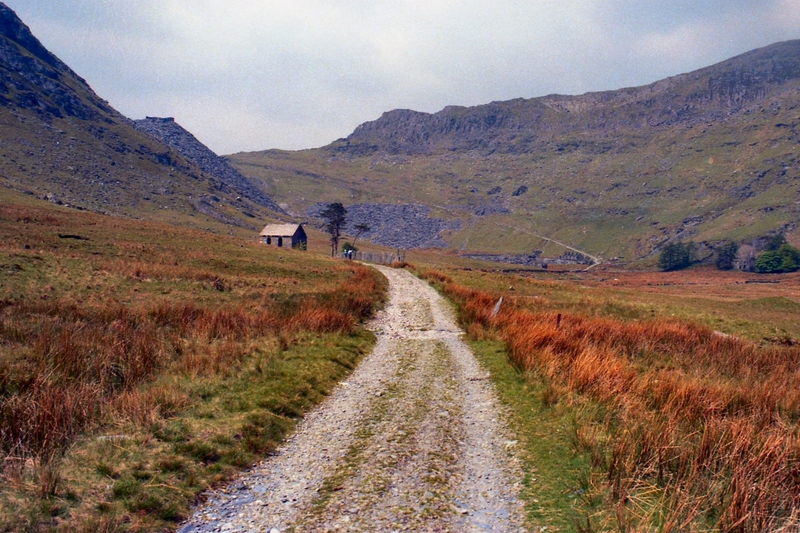 The solitary building beside the track ahead (the actual tramway route just here is slightly off to the right at this point) is Capel y Gorlan - one of two chapel remains in the valley, the other being Capel Tiberias, located close to Cwmorthin quarry. 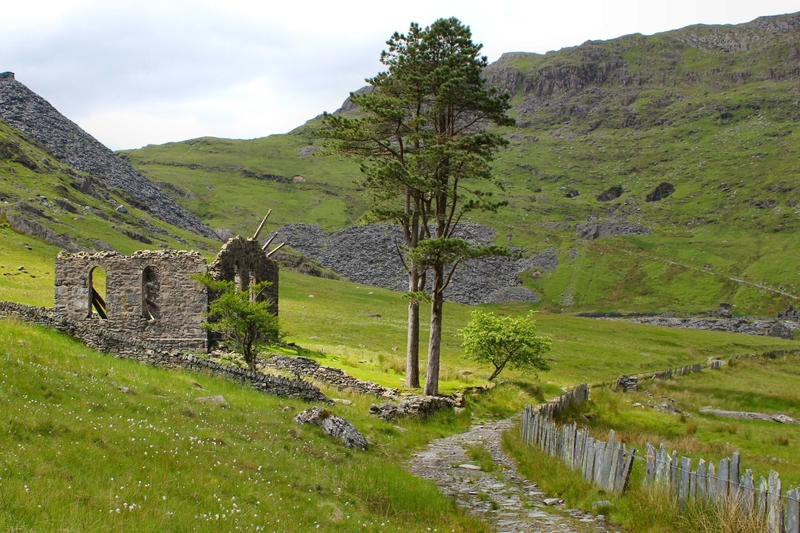 Capel y Gorlan was a Calvinistic Methodist chapel, built in c1867, that once served a community within the valley which had grown around the expanding slate quarries. Unused since the 1920s - 30s it still retained its roof up to the 1970s when the slates were stolen, but by the time of this view the structure at least was still intact. 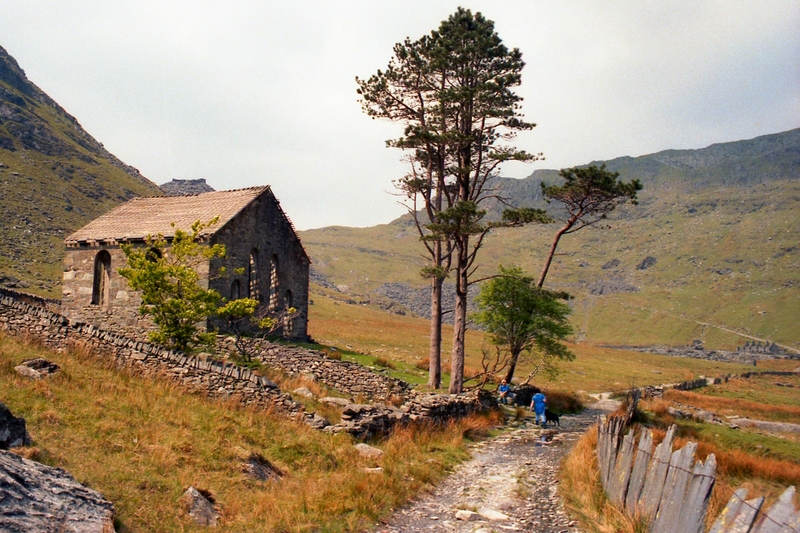 Note the walling surrounding the chapel and the slate fencing beside the path. As mentioned the tramway proper is slightly off to the right here and rejoins the route just beyond the chapel. Note; Capel y Gorlan is also known as Rhosydd Chapel. Jump forward 23 years and the poor chapel hasn't faired well. Sadly the roof structure has collapsed and the walls are crumbling away. Away in the distance, climbing the hillside to its summit above the rising Rhosydd track, is the faint outline of the Conglog incline with four holes above (like an animals paw print) denoting chambers opened to air. Approaching Conglog and the tramway crosses boggy ground by a short causeway and a small bridge over the stream. In view here are the remains of Rhosydd Terrace (Tan-yr-Allt) with, on the left, the row of launder pillars leading to the mill site. Note the small hut just beyond the end of the causeway. A more modern view shows a few things have changed since 1990 - Rhosydd terrace has lost three of its chimneys and the (right) end wall has virtually collapsed. Also one of the pillars has fallen and the small hut is not in good shape. 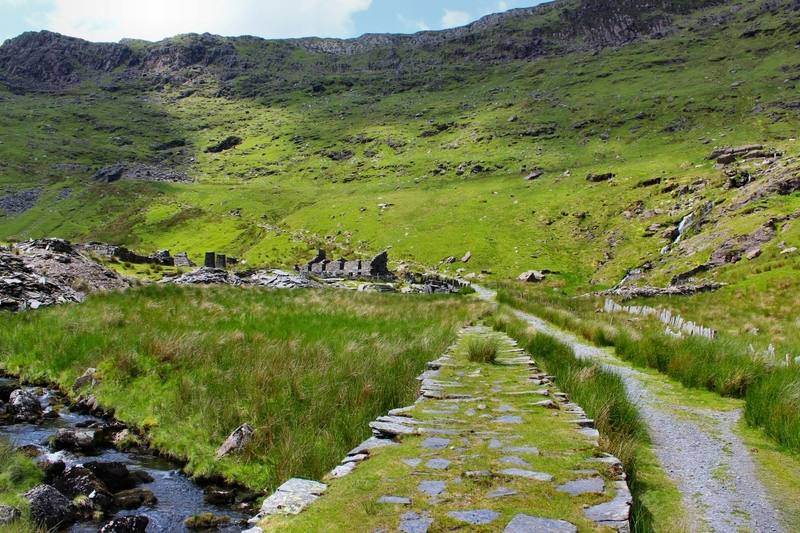 The Tramway causeway, although a little greener, is still intact. Built to replace carting (or pack horses?) 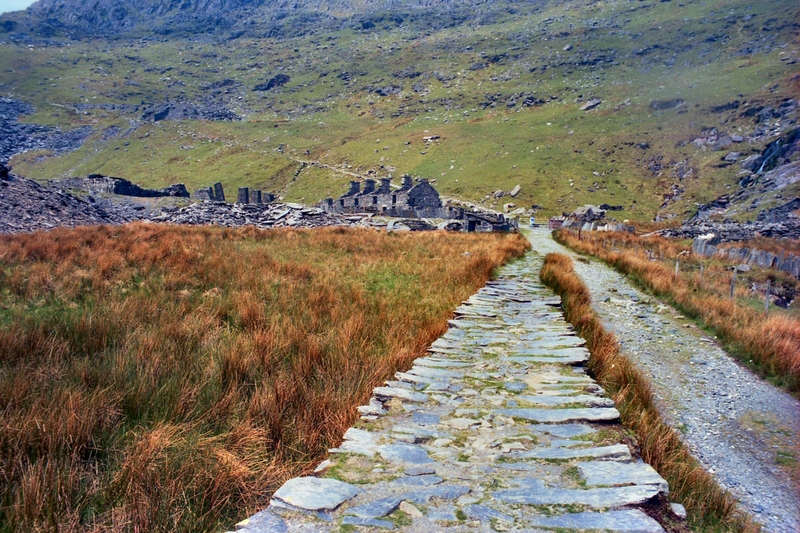 down to Tanygrisiau, the tramway opened sometime after the Conglog Slate & Slab Co. Ltd began serious work here (c1874 - Dates vary) and was entirely horse worked during its working life - the last load being taken down in 1909. The route followed closely the course of an existing path (as mentioned) that was built by Rhosydd (c1853) which inturn had replaced an older path that ran around the eastern side of Llyn Cwmorthin. This old path went off to the right of photo, passed close by the site of Plas Cwmorthin, then continued onwards around the lake to a point now long buried under Cwmorthin workings.